Elegance and style refined for the ultimate nursery, this Emily 4 in 1 Crib by Da Vinci will be a gorgeous focal point in your baby's space. 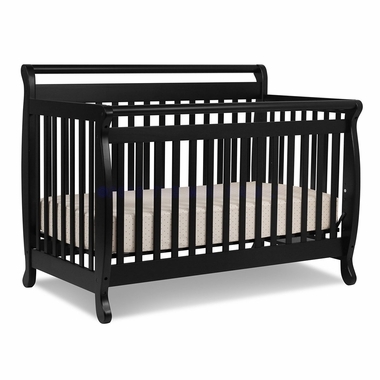 Finished in dramatic ebony, this crib will make any color scheme pop. The item is built to last from solid pinewood, and constructed to become a staple in your child's room for years to come. With the 4 in 1 converting option, you can transition your little one with ease and familiarity. With the additional rail kit, this crib can be made all the way to a full size bed! Da Vinci creates items that exceed all safety standards and are created from non-toxic materials for your baby's ultimate care.